Butterflies feed on the nectar of flowers. A beautiful, abundant flower garden can be Sunday brunch at the Ritz for a butterfly. One plant especially attractive to butterflies is commonly known the butterfly milkweed plant, or Asclepias speciosa. These handy, low-maintenance plants have showy flowers rich in nectar. As an added bonus, butterflies that feed on this and other native milkweeds acquire chemical protection from predators. Unfortunately, non-native milkweeds can have the opposite effect, exposing vulnerable butterflies to predation. Of course, as with the case of the milkweeds, the very best plants for butterflies are California native plants. Since the plant and butterfly species evolved together, native plants naturally support native butterflies by providing both the nectar they need to thrive and the larval plant host they need for laying their eggs. Butterflies are particular about where they lay their eggs as the caterpillars can eat only certain plants. An interesting butterfly you can attract to your garden is the pipevine swallowtail, Battus philenor. As the name suggests, these butterflies lay their eggs only on the undersides of leaves of members of the pipevine family, such as the California Dutchman’s pipe, Aristolochia californica and Virginia snakeroot, Aristolochia serpentaria. As with the milkweeds, when the larval caterpillars consume the native pipevine, a chemical in the plant makes the caterpillars poisonous to birds and so birds naturally avoid them. Other butterflies have evolved to mimic their size and coloring so that they too will be protected from hungry birds. In fact, the pinevine swallowtail can be difficult to identify because several other butterflies are very similar in appearance. In addition to providing a larval host to these butterflies, the pipevine is a cool-looking plant with very unusual flowers. The good news is that many butterfly plants are drought-tolerant. Among those that are especially low in water use are salvia, lavatera, pineapple guava, rose snapdragon, ceanothus, and yarrow. Butterfly plants can also be fire-safe. 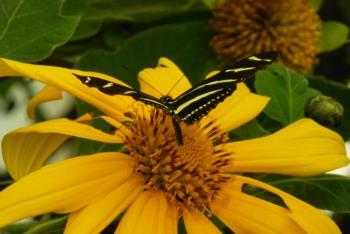 For example, lantana and coneflowers are excellent butterfly plants that are also fire-safe.